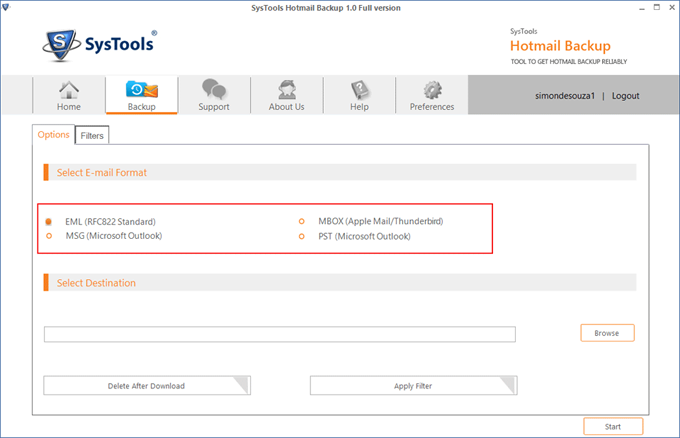 Tool Backup Hotmail Emails to PST (MS Outlook file), MSG (MS Outlook message), EML (Windows mail) and MBOX (Apple mail & Thunderbird) file formats. Supports Backup Hotmail Emails to Outlook 2016, 2013, 2010, 2007, 2003. 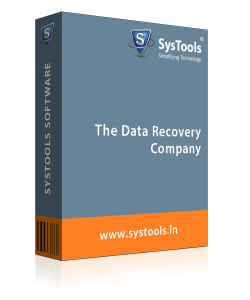 The tool provides backup of multiple formats in local backup creation such as Hotmail Backup to PST, MBOX, MSG, EML. The output files can also be imported & used on their supportive email clients. Product has folders Filter that allows downloading of all folders by default but any folder (inbox, drafts etc) can exclude or include during backup process. Hotmail Backup Software includes one more special filter that downloads Hotmail emails according to applied date range. Set mail filter option to download any specific time data. The Hotmail Software maintaines the history of backup. In case the internet connection is lost or the software stops in between the conversion of Hotmail to Outlook.com, still the history will be provided of how much data was downloaded. Backup Hotmail Tool has option to save hotmail emails into desktop or any other location of computer hard drive & pen drive. New folder can be also created while setting the storage location. 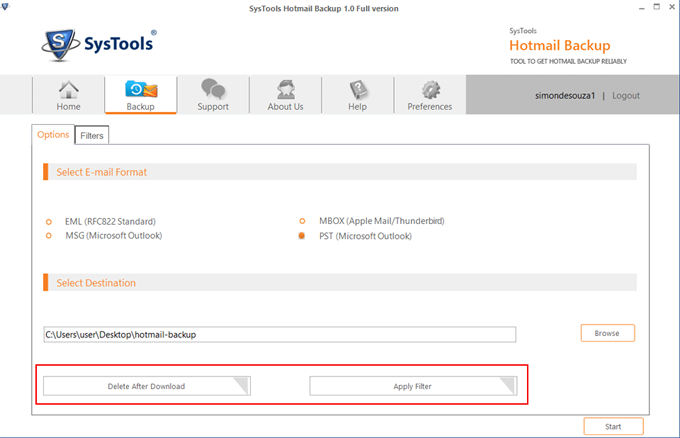 Hotmail Backup Tool has very unique function "Delete after Download" By enabling the option, tool will permanently delete all those folders data which were selected for backup. The application of archieve Hotmail to Outook comes with Pause & Resume function. While backup hotmail account, click Pause to stop the process and click Resume to start halted backup process. Advance algorithm is added in tool to create interrupted backup history. Just select the process from list and click to continue to re-start backup from last halted point. Set internet usage while backup. Just put total speed in mbps/kbps & usage in (%) for a time period to minimize the bandwidth congestion during working hours. 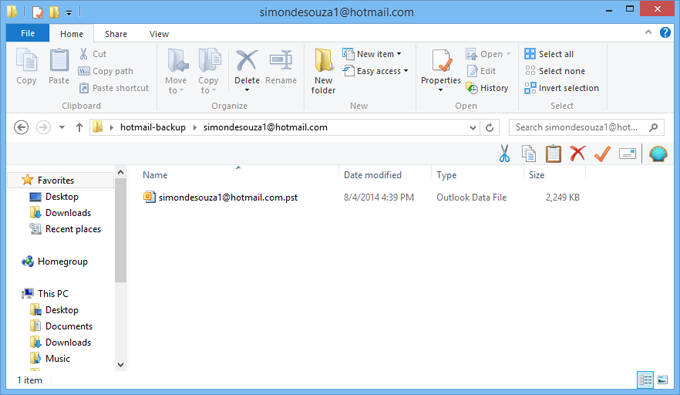 How to Backup Hotmail account using the Product? Step 1 : First of all, download the Hotmail Account Backup product and do the installation. For that, launch the setup, accept terms of policy and follow the next-next process. Step 2 : Once the installation process gets over, launch the Product. Here select the language and fill the user & password details. Check the Remember option (if you want) otherwise click on Login to proceed. Step 3 : Once logged in, select the any E-mail format (EML, MSG, MBOX or PST) and set a location using browse button to download Hotmail Email data in computer hard drive. Step 4 : After that, you may set Two optional filters: Delete after Download (Enable to remove the data from server after download) and Apply Filters (To download required data only). Step 5 : Under Apply filters, you can include or exclude any particular folder (Inbox, Drafts, Archive, Sent, Junk, Deleted or any custom). Also you can set Time Interval to download data between dates range only. Step 7 : Once you get done with all required steps & optional settings, Just click on Start button to start downloading process. Step 8 : The downloading process status is shown through different criteria. Here you can Pause & Resume the process. Step 9 : If the backup process get interrupted due to Internet failure or any other cause, history logs get created. From here, you may restore the backup process from last point. Step 10 : After the completion of download process, the hotmail backup software shows the backed up data can be located in computer drive (selected location). Can I save Hotmail account emails into USB drive? Yes, you can save hotmail emails to USB drive, hard drive, desktop or even any location of the computer by using Hotmail Backup Software. Is MS Outlook installation required to Export Hotmail Emails in Outlook PST file? Yes, MS Outlook installation is required to download hotmail emails to outlook pst file format. 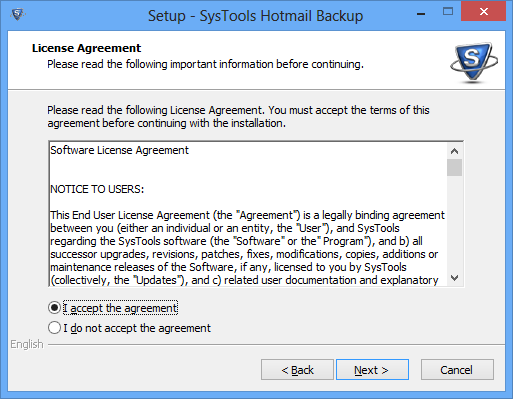 Software compatible to work with MS Outlook 2013, 2010, 2007, 2003. Can I take the backup of my live.com & outlook.com account? "I was wondering if this tool could take backup of live and outlook accounts as I am eager to take backup of these two along Hotmail Backup." 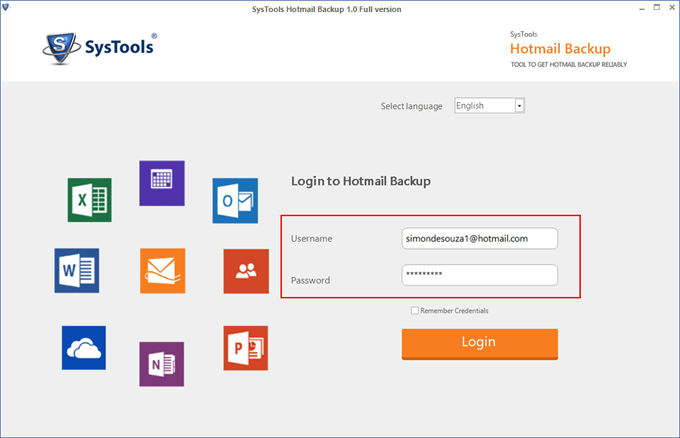 Hotmail Backup Software supports to download & backup data from all Microsoft mail service alias (outlook.com, outlook.in, hotmail.com, msn.com, live.com). Is internet connection necessary for backup. What if an internet connection breaks in between? Yes, internet connection is required for account data downloading. But if any how the connection breaks in between you can continue the process from where it gets interrupted. The Hotmail Email Backup Software creates a history of the transfer process thus click resume button it will restart downloading. If I apply delete after download option, can I get deleted data in Trash folder? No, you will not get data in Trash folder. If the option Deleted after Download is enabled while backup, Hotmail Emails Backup Software performs permanent deletion of backed up data after completion of download process from Hotmail Account. 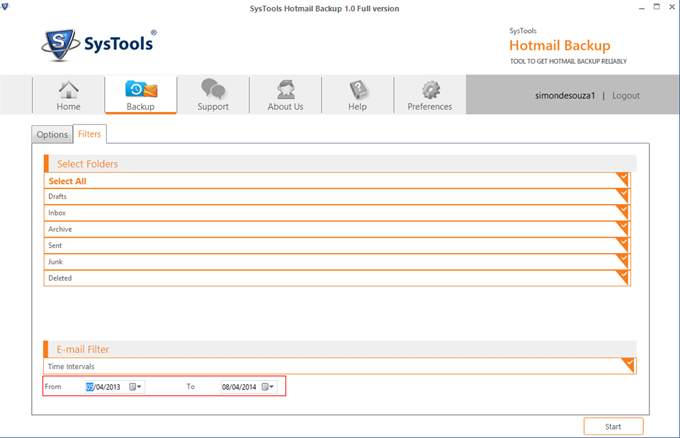 I had taken backup of Hotmail Emails in EML format. Can I open these eml files in Windows Live Mail? Yes, Hotmail Backup Software saves data in standard EML file format. Thus user can open or import these eml files with windows live mail. Outlook Express, ThunderBird, Apple Mail and any other EML format supported mail client. If I take backup of Hotmail emails in MBOX format, is it possible to access these file with Apple Mail? Backup Hotmail Email data in MBOX file format on windows platform then copy that files through external hard drive or pen drive on Mac platform. Here, access these mbox files with Apple Mail, MS entourage. Also mbox file can be accessed through any mbox supported application such as Mozila ThunderBird, Eudora etc. Many users in our organization have learnt how to use the Hotmail Backup Tool in a very short time period. The output obtained by the tool is brilliant in terms of accuracy, speed and safety. 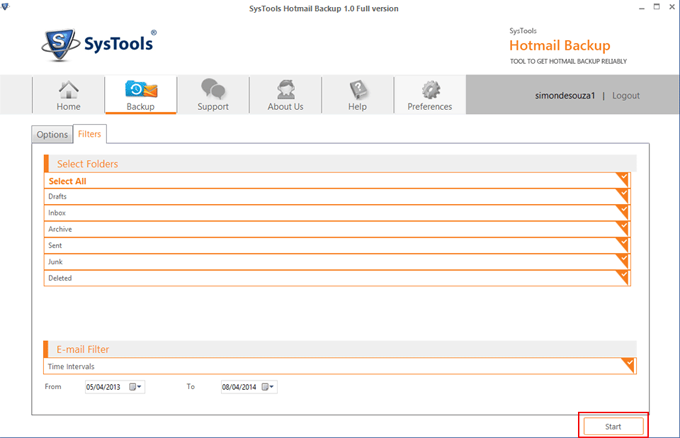 The tool is a most valuable resource to backup Hotmail account data. 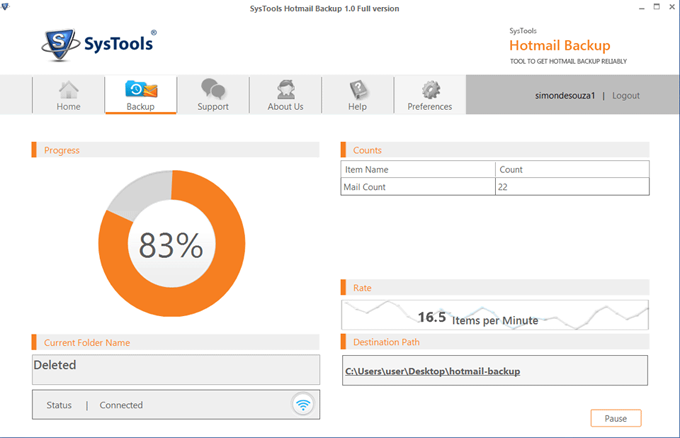 Hotmail Backup Software automates time consuming tasks, work smarter, perform in -depth analysis. It is efficient keeps user happy so that they can spend more time to reach their goal. It perfectly backup all the data specially migrates Hotmail to PST very well and provides a seamless access to client. Our organization main account is on hotmail. There was lots and lots of data which was increasing day by day but this hotmail backup software helped me in managing the data. I would also say the hotmail to PST is the best. Hotmail backup to Outlook conversion is seen very less. I must say this tool not only exported EML to PST but even its very fast. The best part is data is safe and secure.